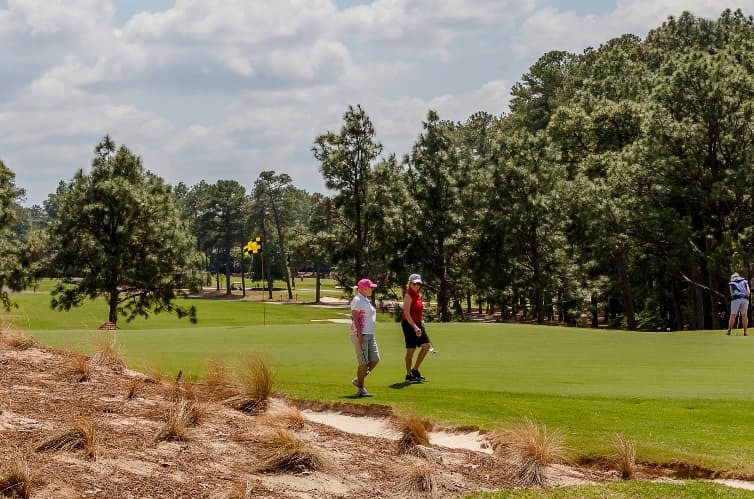 VILLAGE OF PINEHURST – When some people see Pinehurst No. 2 for the first time, they sometimes feel intimidated. Perhaps there’s some awe. Certainly, when some step to the first tee, there are raw nerves and jitters. When Australian Gabi Ruffels got her first look at No. 2 this week, she saw something else. Ruffels knows what she’s talking about. She won two match play matches on Wednesday to advance to the quarterfinals of the 116th Women’s North & South Amateur – joining two other Australian natives among the final eight players. In fact, five Australian-born players reached the Round of 16. One of them, Dee Dee Russell, was eliminated by Ruffels in the afternoon match, 3&1. All five Australians finished among the top 16 in two rounds of medal play on No. 2, which was restored to designer Donald Ross’ original vision by Bill Coore and Ben Crenshaw in 2011, bringing back the native sandscape areas that are filled with wire grass. Ruffels is quickly making a name for herself in golf. She starred first as a junior tennis player and comes from a family of elite athletes – her father Ray Ruffels was a three-time Australian Open semifinalist and won eight singles titles professionally, her mother Anna-Maria Fernandez won five Women’s Tennis Association (WTA) singles titles, and her brother Ryan Ruffels made his professional golf debut at 17 years old in January 2016 at the Farmers Insurance Open at Torrey Pines. Ruffels will face countrywoman Stephanie Bunque in the quarterfinals on Thursday morning. And that home course Ruffels mentioned? That’s Victoria Golf Club, where both she and Bunque are members. Anna Redding reached the quarterfinals of the Women’s North & South Amateur for the fourth straight year. While Ruffels finds familiarity in No. 2, no player left in the field knows No. 2 as well as North Carolina native Anna Redding, who rallied late in her Round of 16 match against Baylor’s Gurleen Kaur to advance to the quarterfinals for the fourth straight year in the North & South. Redding, the runner-up a year ago, reached the North & South semifinals in 2015 and the quarterfinals in 2016. She had to work to get back there, though, on Wednesday. A day after making a staggering six birdies on the back nine of No. 2 to move from a tie for 20th to a tie for first in medal play, Redding fought a balky putter against Kaur, falling 2-down just five holes into the match. She still trailed by two holes through 13, but made brilliant shots to four feet on both the par-4 14th hole and the par-3 15th to square the match. “Both of those birdie putts were from 4 feet, and one of them was conceded, so that was helpful,” she quipped. Redding will face the No. 2-ranked amateur in Australia, Becky Kay, in the quarterfinals. Kay knocked off Cary’s Jennifer Chang 5&4 in the Round of 16. Defending champion Isabella Fierro, who made it back into match play by making the cut on the number, won her morning match to advance to the Round of 16, where she was upended 3&2 by former Big Ten Freshman of the Year, Northwestern’s Stephanie Lau. Lau will face Notre Dame’s Emma Albrecht, who set the program’s best single-season stroke average in 2017-18. Albrecht outlasted Addie Baggerly in 20 holes in the Round of 16. Ruffels’ USC teammate Allisen Corpuz made a birdie on the 18th hole to beat the top-ranked player remaining in the field, Jaclyn Lee, who was coming off the British Women’s Amateur, where she reached the semifinals last month. Corpuz will face Furman’s Natalie Srinivasan, the championship’s No. 32 seed who stunned medalist Anita Uwadia 6&4 in the Round of 32. The quarterfinals and semifinals will be played on Thursday, with morning matches beginning at 7 a.m. and afternoon matches scheduled to begin at 12:20 p.m.
No. 24 Allisen Corpuz vs. No. 32 Natalie Srinivasan, 7 a.m.
No. 5 Gabi Ruffels vs. No. 13 Stephanie Bunque, 7:08 a.m.
No. 2 Anna Redding vs. No. 10 Becky Kay, 7:16 a.m.
No. 6 Emma Albrecht vs. No. 14 Stephanie Lau, 7:24 a.m.